How fickle the rock and roll world can be! Back in early June, just about the time that Staind's latest album, Break The Cycle, was first released, rumors were running rampant within the rock community that the band's record label, Elektra Entertainment, was in some big-time trouble. Despite having such proven fan favorites as Metallica and AC/DC on their corporate roster, word on the street was that the future of Elektra was in serious doubt. Talk centered around the label being absorbed by a larger company...that jobs could be lost...careers were in jeopardy. Then Break The Cycle came out and promptly sold 750,000 copies its first week... a million copies within two weeks... two million copies within two months. Suddenly Elektra found itself among the hottest labels in the music biz— thanks in no small part to the historic efforts of Staind. So now you understand why we say how unpredictable the winds of rock and roll fortune can be. For their part, vocalist Aaron Lewis, guitarist Mike Mushok, bassist Johnny April and drummer Jon Wysocki have taken all this internal mumbo-jurnbo in stride. 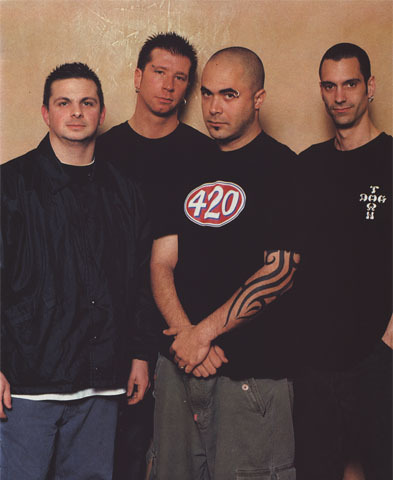 They may have been somewhat aware of the tenuous situation within their label (though they're reticent to discuss it), but that kind of industry indecision apparently had little or no bearing upon the musical content the band created for their latest disc, Thankfully for Staind, they've always had a special ability to shut out most of their external pressures and distractions, an affinity for focusing on the task-at-hand to the detriment of virtually everything else in their seemingly troubled lives. That's just one of the reasons that this emotive, explosive band from Springfield, MA has low emerged as one of the most successful and respected bands around, true torch-bearers for the new metal society of late 2001. "From the moment we began working on this album, our focus has been on making the best album we could, and on nothing else," Mushok said. "We try not to get involved with too much of the business side of things— especialiy when we're focusing on being as creative as we can be. There really isn't room for both. Obviously, we're very pleased that the hard work we put into Break The Cycle has been (beneficial to a lot of people, but we're 'happiest that it's been great for us." Great, indeed! 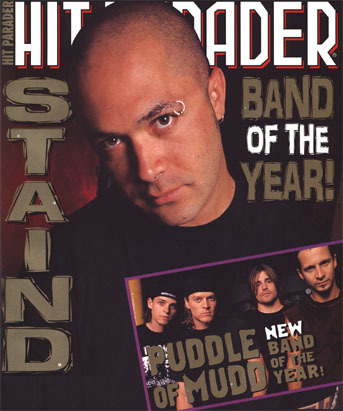 With the immediate acceptance of the single It's Been Awhile, Staind not only proved that the platinum success of the major label debut. Dysfunction, was no fluke, but that they could actually expand upon their initial core audience. 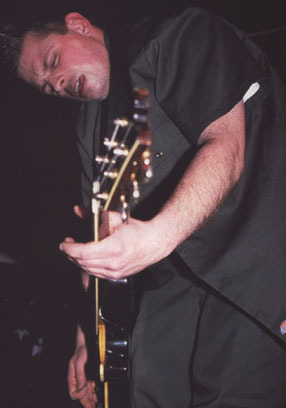 That semi-acoustic song, which fans have heard in a somewhat different version on previous Staind tours, was such an out-of-the-box smash that even those closest to the Staind camp— including some of the group members themselves— were caught somewhat off-guard. The fact is, having a song that becomes an instant cross-over hit is just about the best thing that can ever happen to a hard rock band— especially one as determined as Staind has been to maximize their commercial potential while sacrificing none of their artistic integrity. "We re-did It's Been Awhile in the studio," Lewis said. "But it's been a part of our shows in the past. We've always liked it, and just wanted to find just the right place to use it. it's a pretty self-explanatory song, it's about all the things you don't do often enough, like say you're sorry, make a phone call, or even let yourself feel proud about something. Obviously It's hit a nerve within a lot of people who've heard it, and that's great. 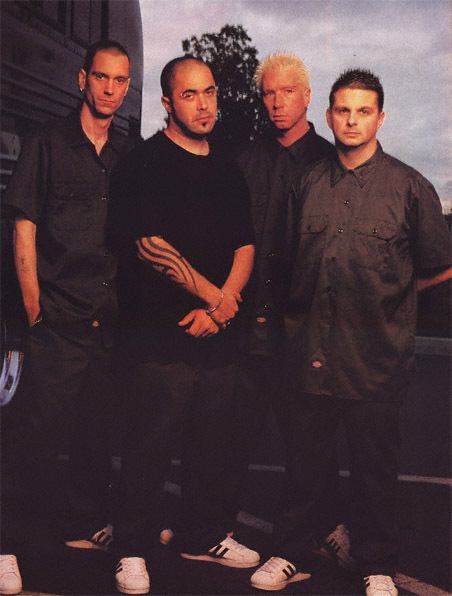 It does show a somewhat different side of Staind, but it's still very much in character with what this band is about." 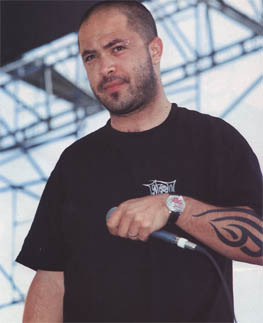 There's no question that what Lewis describes as the quintessential "character" of Staind has noticeably expanded on Break The Cycle. While on both Dysfunction, and the band's debut effort, Tormented, this quartet often came across as a dark, brooding and angry lot, this time around there is a palpably more expansive and emotive feel to al! of their music. Sure, such songs as Can't Believe and Waste are still heavy and dramatic, but others proudly show that for the first time in their professional careers, these guys seem rather content with their lot in rock and roll life, and satisfied with their roles within contemporary society. For a band like Staind, that's a Big Deal. "There is a big difference in the way I view the world," Lewis said. "Being married, and having a much more stable home environment has provided me with a foundation. Since then, I've learned a lot about myself and what makes my life work. My life hasn't always been easy, and I can be a very emotional and dark person. But I have begun to see a brighter side to things. I imagine our music will always be rather dark, but from now-on there will also be other elements in the mix." Perhaps the key moment for the Staind "phenomenon" that has occurred during the second half of this year actually doesn't have its genesis on any of the band's albums... or even in 2001! That moment actually occurred on the Family Values '99 disc where the song Outside— another tune that's long been a part of the band's acoustic repertoire— emerged as one of the most oft-played rock radio tracks of late 2000 and early 2001. That song's evocative, emotional bent and powerful lyrical dexterity opened up a lot of ears to this New England-based band. So when It's Been Awhile followed in a somewhat similar vein, the entire rock world was ready to seize upon the song, in the process transforming Staind into a true international sensation.